There used to be an axiom in political reporting that the children — especially the smallest ones — of politicians should remain off limits in the back and forth political attacks over policy. But now that Donald Trump is President of the United States, it appears that the media no longer cares if people viciously attack little kids. NBC is an inglorious example of that today since a writer for “Saturday Night Live” called ten-year-old Barron Trump a “serial killer” and NBC has done nothing about it. Destroying Trump is the media’s only goal and if they have to do it by destroying a little boy, then so be it. Like any fascist regime, the media’s new axiom is the ends justify the means. Be prepared for this for the next four (eight?) years, won’t you? You also may recall just after the election when Rosie O’Donnell, the foul “comedienne” and constantly fired TV host, was criticized for her attacks against little Barron Trump. In November she began tweeting that Trump’s son was autistic sending many to their own Twitter accounts to slam O’Donnell for something that is none of her business. But, again, remember, liberals are allowed to try and destroy children as long as their parents are also destroyed. 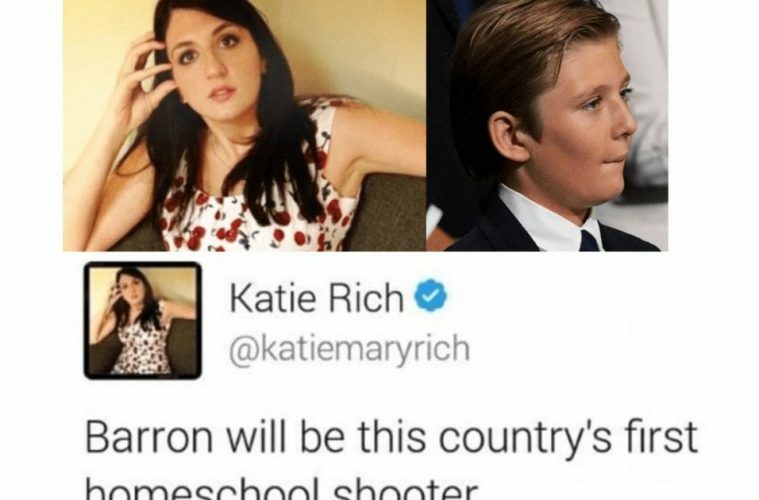 Into this arena of hate, entered one Katie Rich, a “comedy” writer for NBC’s “Saturday Night Live” who thought it would be gosh darn hi-lar-ee-us to call President Donald J. Trump’s ten-year-old son a serial Killer. This “comedy” writer took to her Twitter account to attack the little boy on the same day the child’s father took the oath of office to become our 45th President.